On November 26, 1969, Promoter Ed Francis presented eight professional wrestling matches at The Honolulu International Center. In the earlier matches: Tank Morgan defeated Rene Goulet, Georg Harris over Karl Von Steiger, and Freddie Blassie and Don Leo Jonathan battled to a draw. In a midget tag team match, the team of The Mighty Atom and Little Bruiser defeated Wee Willie Wilson and Cowboy Lang. George Harris has Karl Von Steiger trapped in the corner. Hahn Lee belts Curtis Iaukea from outside the ring. In the match for the Hawaiian Championship, Ripper Collins and The Missing Link. After each wrestler took a fall, Collins was disqualified and The Missing Link won the match. However, Collins retained his Hawaiian Championship since the title cannot change hands on a disqualification. The biggest surprise of the night was the scheduled match between Friday Allman and Bobby Shane. 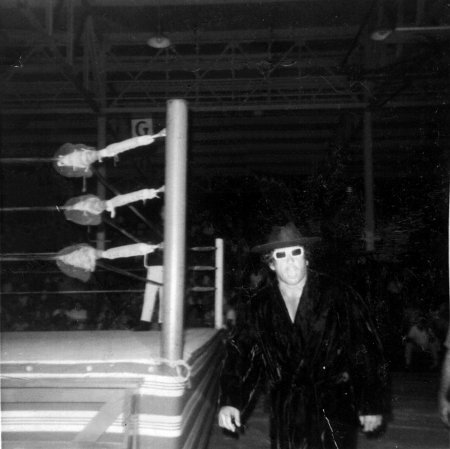 As Shane waited in the ring for Allman to arrive, Allman exited the locker room then stepped aside and out came Handsome Johnny Barend who started heading toward the ring. Johnny Barend returns to action in Hawaii after a year's absence. Barend was making his first appearance in the islands in almost a year. Barend approached the ring wearing a black cape, top hat, and dark glasses. As soon as the bell rang, Barend attacked Shane and tore him apart. Barend used three bombs away and a press to win the first fall in the time of 3:21. When the bell rang for the second fall, Barend attacked Shane, who was lying stationary on the mat. The referee went to check on Shane, who was unable to continue. Barend was awarded the fall and the match. Barend then exited the ring towards the locker room and Shane had to be removed from the ring on a stretcher. 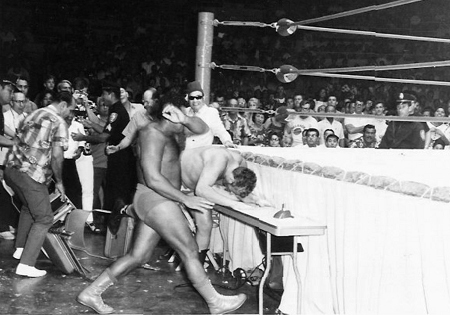 Pedro Morales slams the Sheik's head into the timekeeper's table. The main event was a match for the North American Championship. 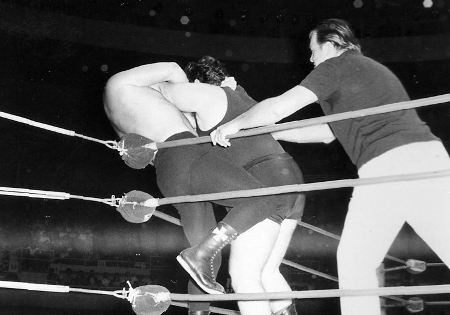 Pedro Morales, the champion, put his title on the line against The Sheik. Morales wanted revenge for the time The Sheik threw fire in his face. The match was two out of three falls with championship rules. The Sheik applied a Boston Crab on Morales to take the first fall. Morales then put The Sheik in a back breaker and got him to submit to win the second fall in the time of 1:12min. The Sheik applies the Camel Clutch on Morales. 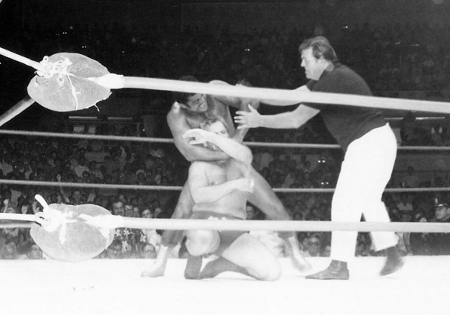 During the 3rd fall, Morales soon got The Sheik in a sleeper hold and as The Sheik was about to go under, his manager, known as The Weasel, broke up the hold by attacking Morales. The Sheik was disqualified and Morales won the match and retained his belt. 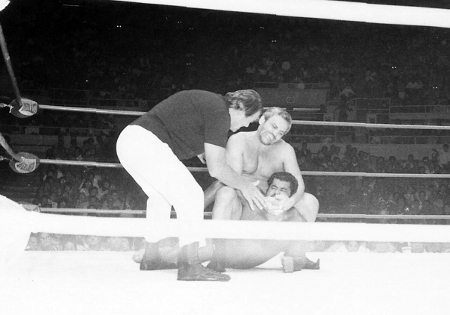 Pedro Morales works on the Sheik in the middle of the ring.